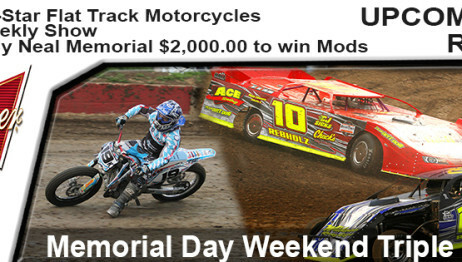 Join us this Memorial Day Weekend for 3 exciting nights of racing! 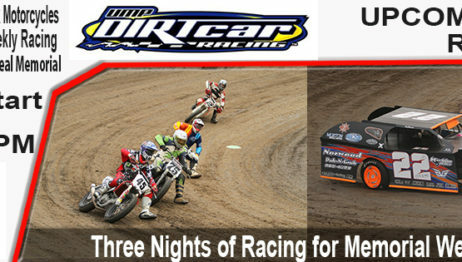 Beginning this Friday night, Peoria Speedway opens with the AMA All-Star Flat Track Motorcycle Series . 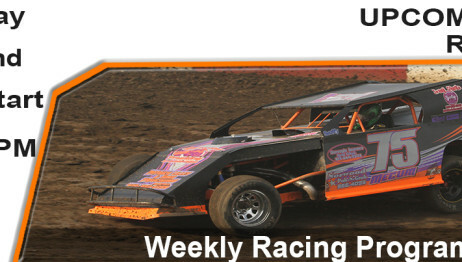 Racing begins at 6 p.m. Weekly Racing continues on Saturday, May 26th, and the Billy Neal Memorial Race on Monday, May 28. 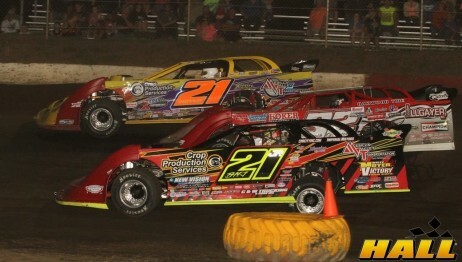 Unfortunately, Mother Nature has not been cooperating this racing season! 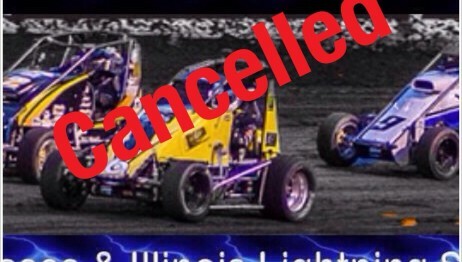 With the rain over night and more rain in the forecast we made the tough decision to cancel the races on Saturday, April 14th Thank you for your understanding and we will see you next week on April 21st. 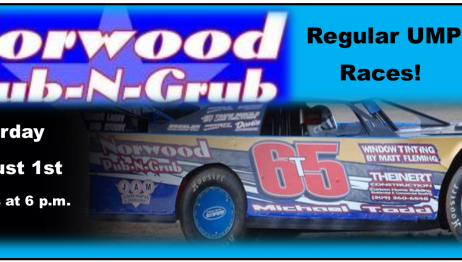 2018 Peoria Speedway Northwoods Mall Car Show returns on February 17th & 18th. 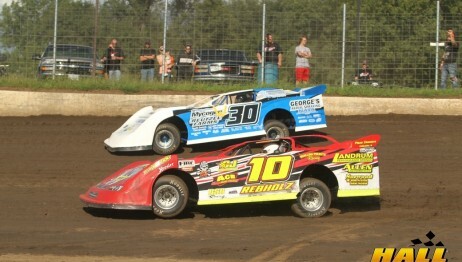 Come out and see 16 of the cars and stars from the Peoria Speedway. 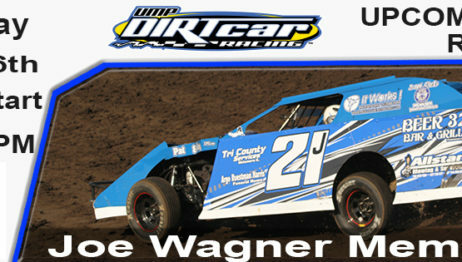 We will have driver autographs from 1-2 Pm each day at each drivers car. 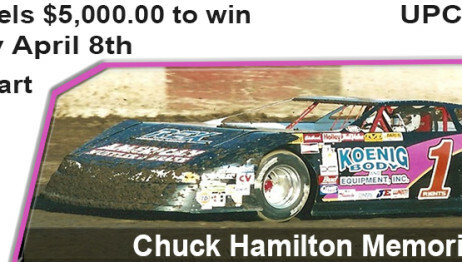 Each driver will also have buckets to collect then donate money to Autism Awareness. 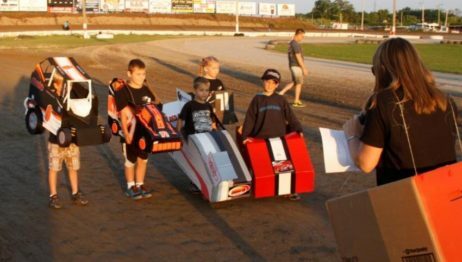 Race Night Advertising Package Now Available for the 2018 Race Season. 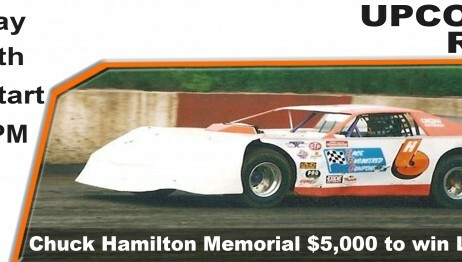 Package is $500.00 per night and includes 25 Free Grandstand Admission Passes for your Sponsored Event. 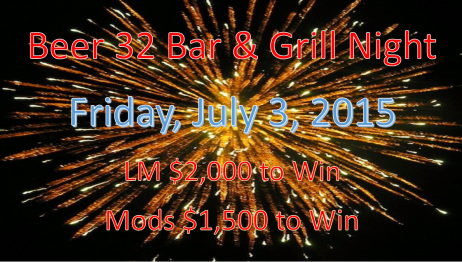 Call 309-678-3860 or 309-357-3339. 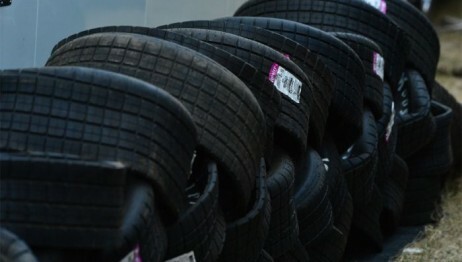 With the rain we are getting now and more on the way we are forced to cancel everything for this weekend. 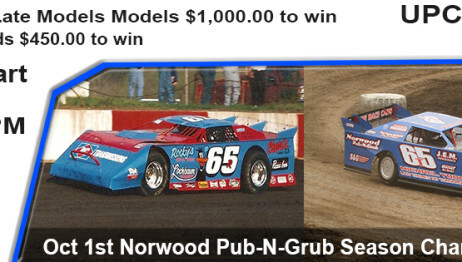 Norwood Pub-N-Grub Season Championship will be made up next Saturday and Family Fun Day will be made up next Sunday. 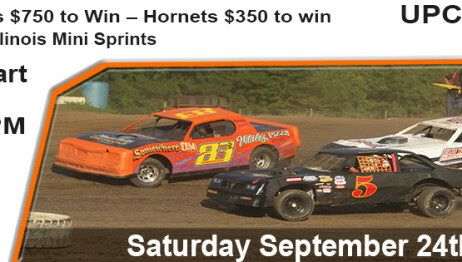 Racing picks back up Saturday September 16th with it only being $9.00 to get in. 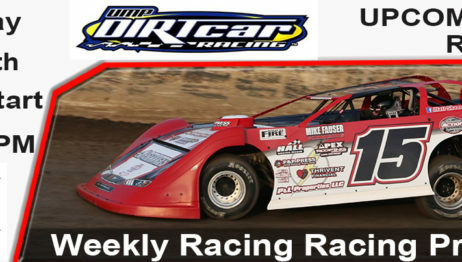 Racing this weekend is the UMP Late Models, UMP Modifieds, UMP Street Stocks, UMP Hornets, Crate Modifieds, and Steel Block Late Models. 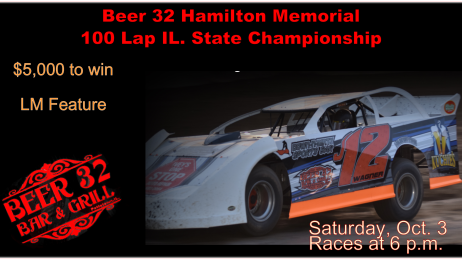 Pits Open at 3:00 p.m. Grandstands Open 4:00 p.m. Drivers Meeting 5:15 p.m. Draw Cutoff 5:15 p.m. 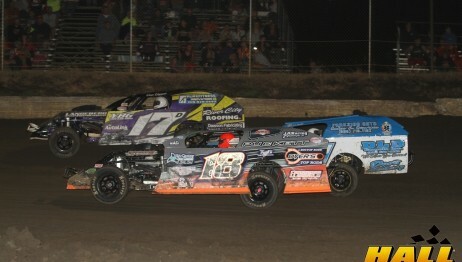 Hot Laps 5:30 p.m. 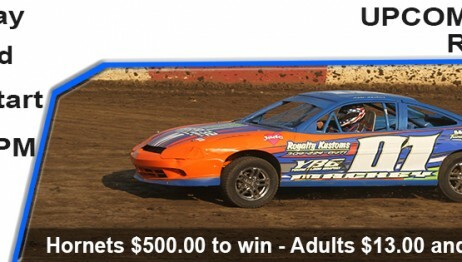 Racing starts at 6:00 p.m.
August 26th Weekly Show Ace Used Auto Parts Night and Lower Front Gate Price. 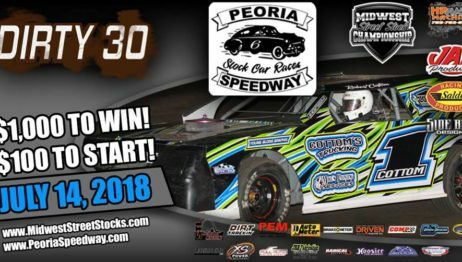 The Peoria Speedway would like to thank all the fans for the support they have given us during the 2017 season. 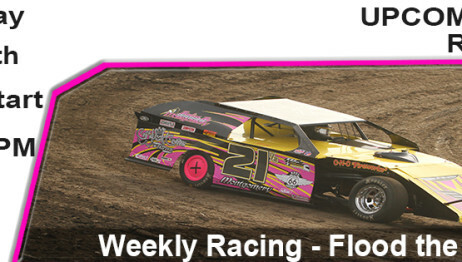 The front grate prices for weekly racing have been adjusted. 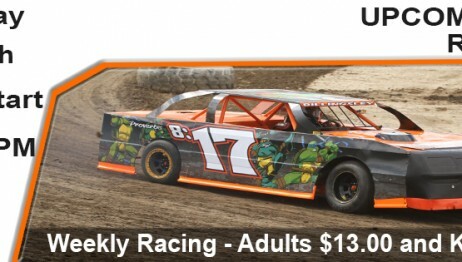 Adults will now be $9.00 kids 6-12 $5.00 and kids 5-under free. Once again thank you all for the support and making the 2017 race season a good one. 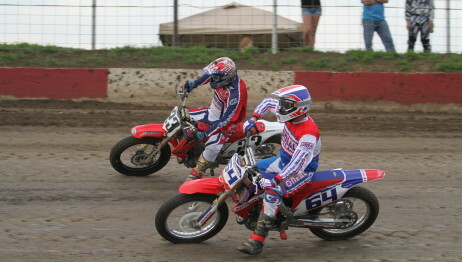 AMA All-Star Flat Track Motorcycles return to the 1/4 mile high banks. 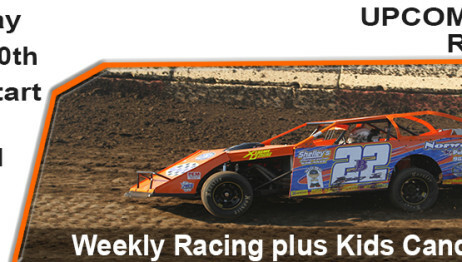 Weekly Racing Prices General Admission – $13.00 Kids $5.00 Pits – $30.00 Kids – $15.00 Pits Open at 3:00 p.m. Grandstands Open 4:00 p.m. Drivers Meeting 5:15 p.m. Draw Cutoff 5:15 p.m. 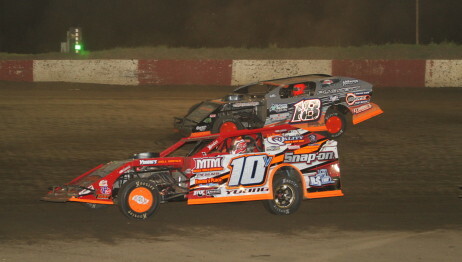 Hot Laps 5:30 p.m. 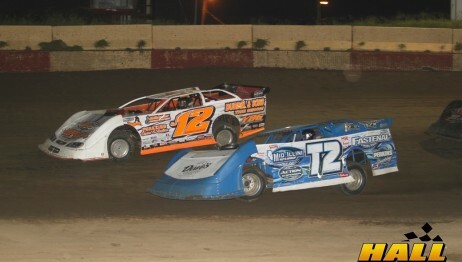 Racing starts at 6:00 p.m.
Wednesday, June 21st Pits open at 5:00 Grandstands open at 6:00 Racing at 7:00 Summit Modified Feature $1,500 to win. Hornet Feature Fields are locked, no cars will be added. Armbands and Tickets from Saturday will be honored. 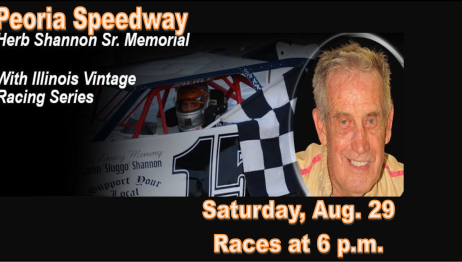 If you were unable to make it to the speedway on Saturday, it will be $5 to get in the Grandstands, and $10 to get into the pits. 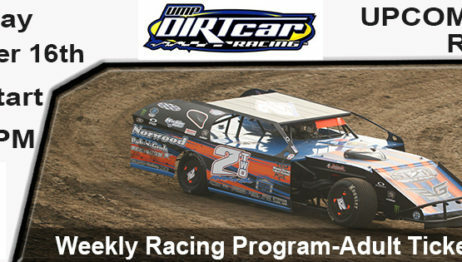 The racing program for April 29th has been cancelled. 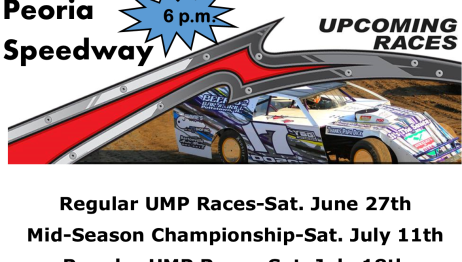 General Admission – $13.00 Kids $5.00 5-Under are Free Pits – $30.00 Kids – $15.00 Pits Open at 3:00 p.m. Grandstands Open 4:00 p.m. Drivers Meeting 5:15 p.m. Draw Cutoff 5:15 p.m. 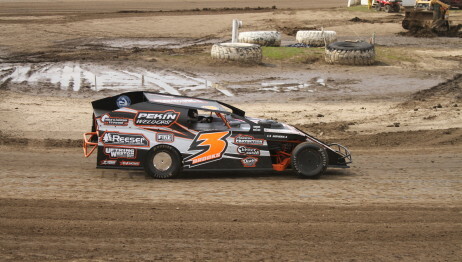 Hot Laps 5:30 p.m. 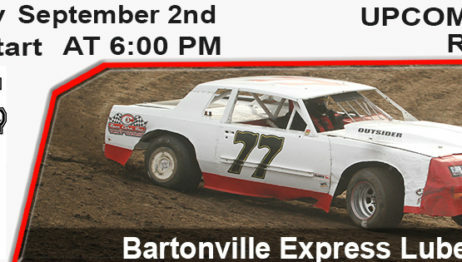 Racing starts at 6:00 p.m. 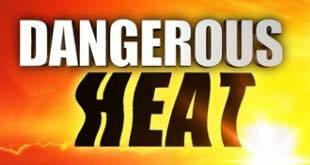 The Peoria Speedway owners have been at the facility all morning to make the best decision for the fans, drivers, and sponsors for today’s races. 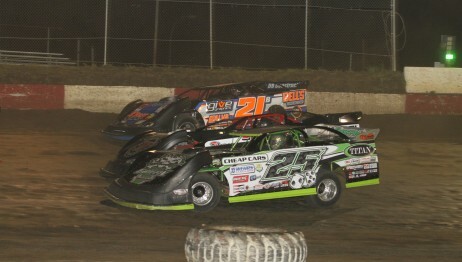 Unfortunately, the large amount of rain we received this week has saturated the grounds so much that we are not able to race today.We don’t want to see fans and drivers getting stuck and not have a good night to start the year off. 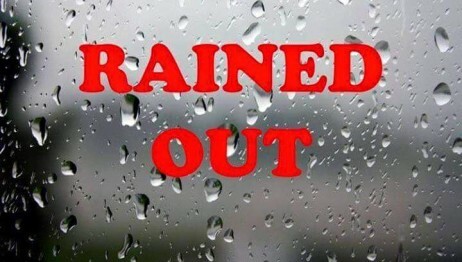 We will be postponing today’s opening night to next Saturday. 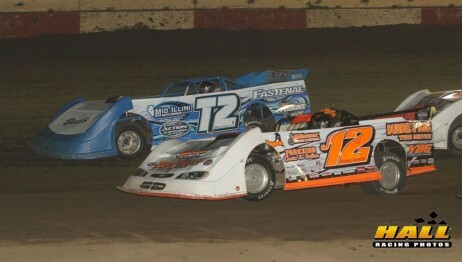 We have been working hard to get the track ready but a decision still has not been made. We are doing everything in our power to get tonight in. I know we said 10 am but with the sun out we don’t want to give up. Tonights practice has been canceled. With all the rain and little sun the grounds have not dried up any. We will see everyone on Saturday for the season opener. 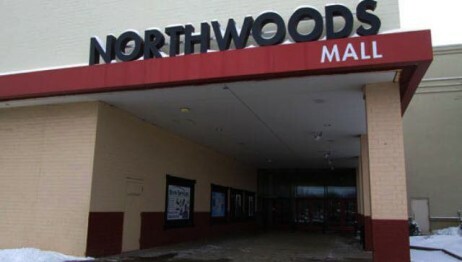 Return to the Peoria Northwoods Mall first time in 14 years. 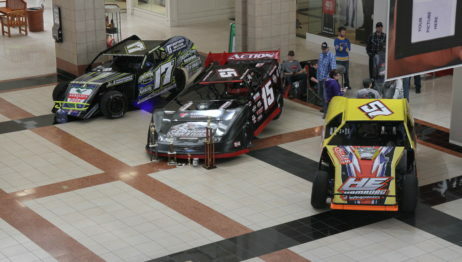 This Saturday we will make a return to the Northwoods Mall for the Peoria Speedway Mall Car Show. 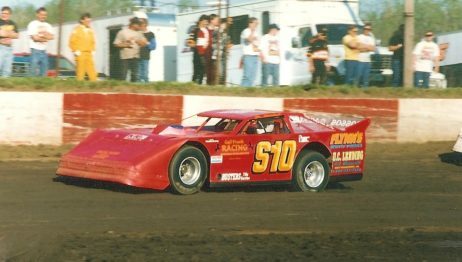 Come check out some of the cars that are ready for the 2017 race season. 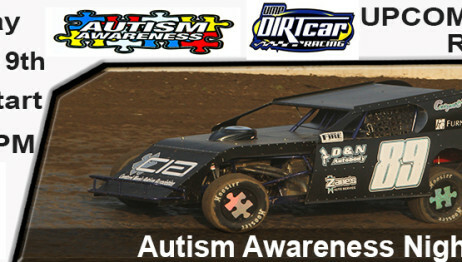 Drivers will have something on the cars to collect for Autism Awareness also. The show will be from 10:00 AM to 9:00 PM. 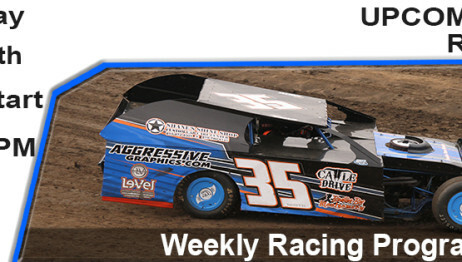 Want to Sponsor a weekly race night here is your chance for $500.00 you can sponsor a whole night of racing. 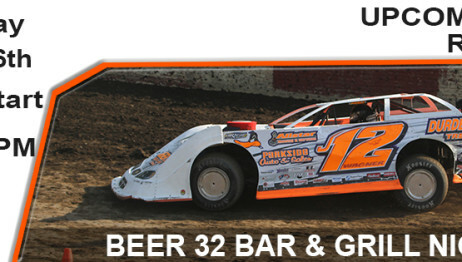 This will come with 20 free grand stand passes that must be used on the night you sponsor. 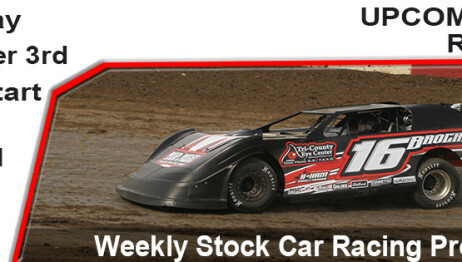 For details you may contact Jason Plumer at 309-678-1141. 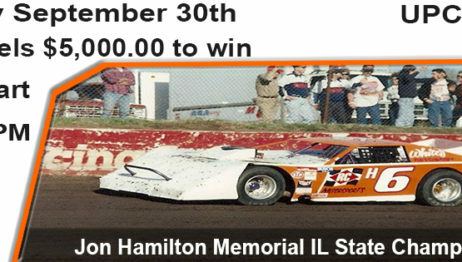 2016 Peoria Speedway Points Banquet When: Saturday November 5th Where: Childers 3113 Dries Lane Peoria IL Times: Cocktails – 6:30 PM Dinner – 7:00 PM Awards – 8:00 PM Tickets: Cost – $30.00 Per Person Tickets will be on sale at the track with Shelley Barnes or you can call Shelley at 309-645-5749. 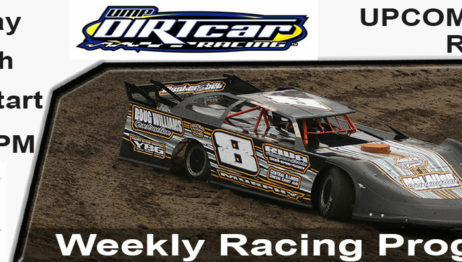 Tonights $5,000 to win American Modified Series Event is a GO!!!!!! 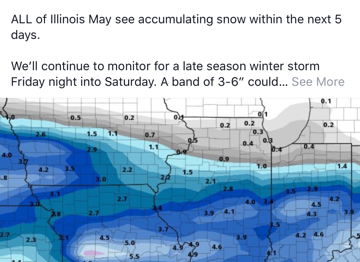 Have had a lot of questions on if the Friday show rains out. 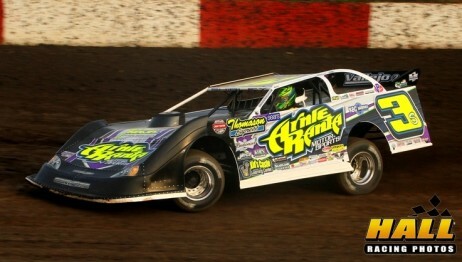 If Friday rains out we are just going to run Saturdays show. 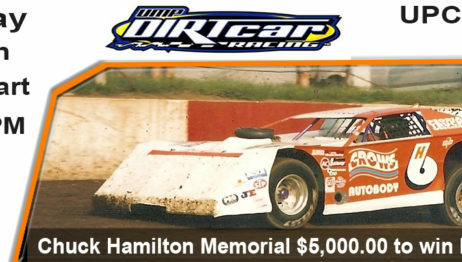 $5000 to win American Modified Series, $2000 to win UMP Late Models, $350 to win UMP Street Stocks, and $250 to win UMP Hornets. 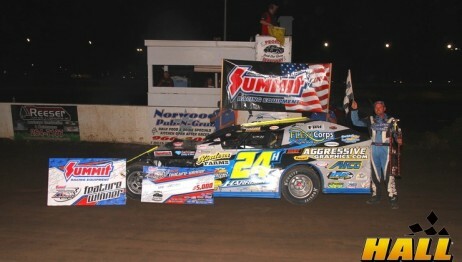 We have fought mother nature for 3 weeks in a row we won the last 2 but she won the fight tonight. 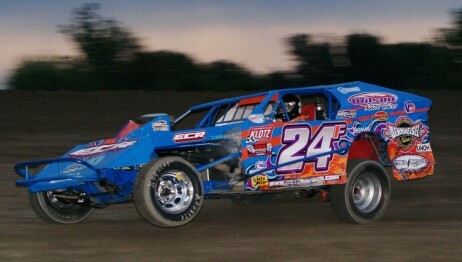 Do to all the rain over night we are rained out for tonight. Hope to see everyone next week. 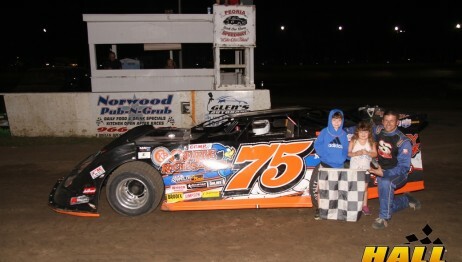 Hess, Weisser, Shannon, Hilmes, Miller, and Strauch win on St. Jude Night. 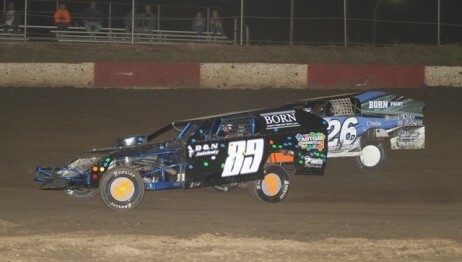 St. Jude Night is a GO we are racing tonight!!!! Tonight’s All-Star Motorcycle Races have been rained out. 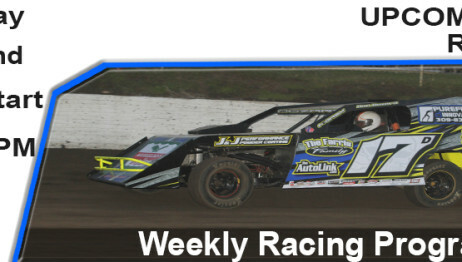 We will return tomorrow for our weekly racing program which is St. Jude night. 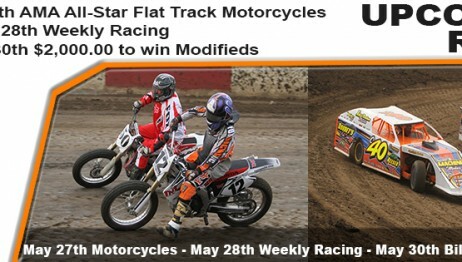 Friday August 12th the AMA All-Star Flat Track Motorcycles invade the high banked 1/4 mile. 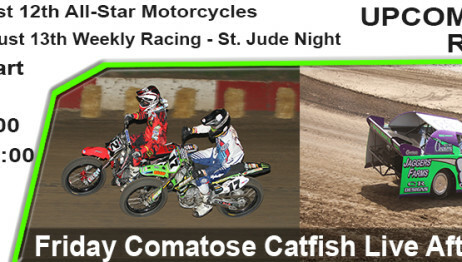 info for AMA All-Star Flat Track Motorcycles Comatose Catfish will play live on Friday night. 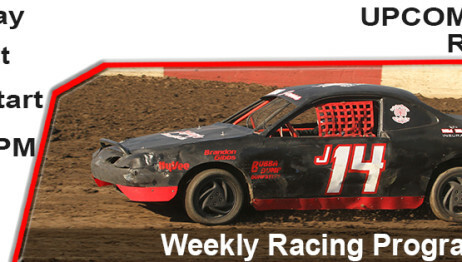 Saturday August 13th is St. Jude Night for our Weekly Racing Program. 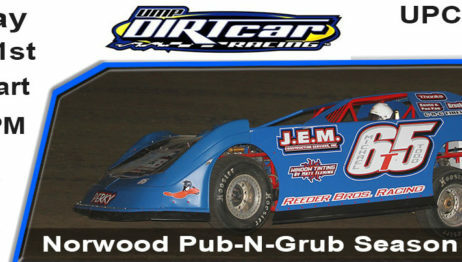 Info for St. Jude Night Pits Open at 3:00 p.m. Grandstands Open 4:00 p.m. 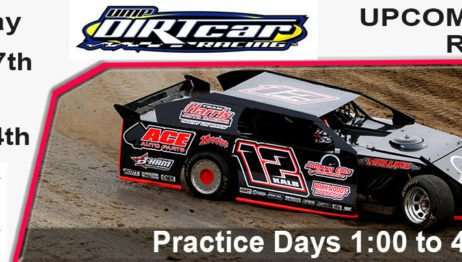 Drivers Meeting 4:30 p.m. 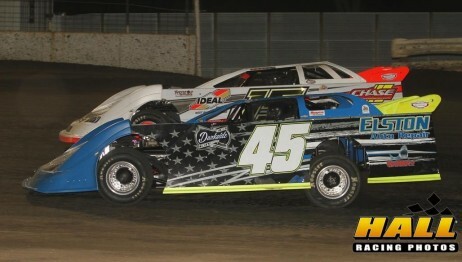 Hot Laps 4:45 p.m. 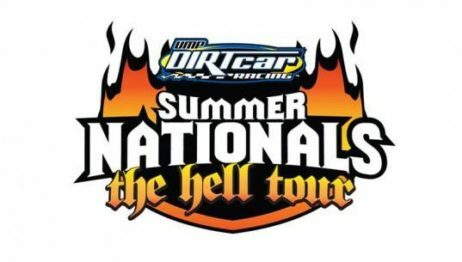 Draw Cutoff 5:15 p.m. Time Trials 5:30 p.m. 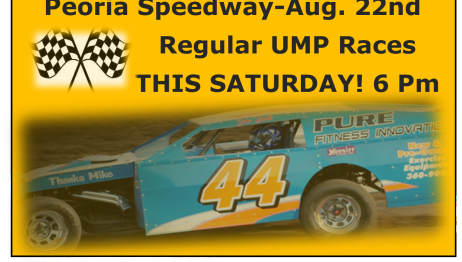 Racing starts at 6:00 p.m.
Its Saturday which means its race day here at the Peoria Speedway. Tonight is the Norwood Pub-N-Grub Mid-Season Championship. 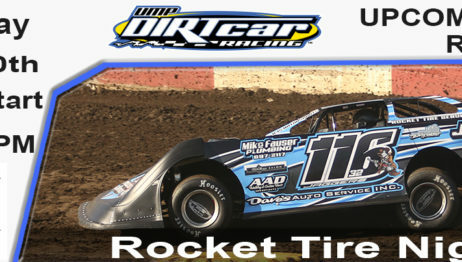 Pits open at 3, front gate opens at 4, hot laps at 5 and racing at 6. 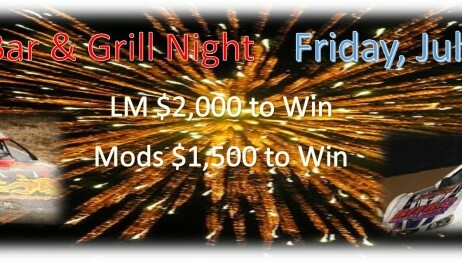 We hope to see everyone out on this beautiful night. 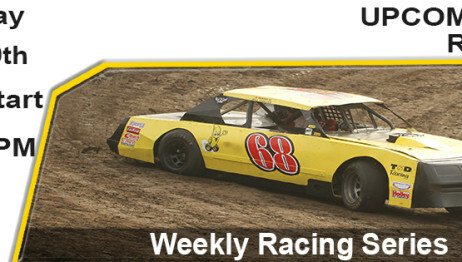 Busy week for Peoria Speedway Staff. 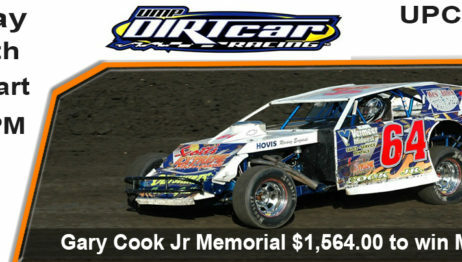 Weisser Claims 3rd Annual Gary Cook Jr Memorial. 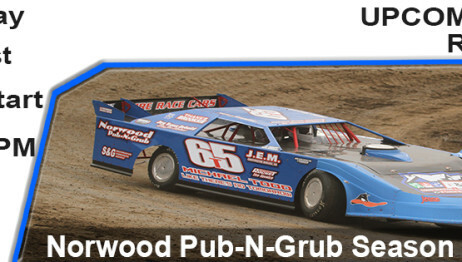 Hess, Chasteen Jr, Hagerdorn, Biswell, Farris, and Mackey win on 2016 Norwood Pub-N-Grub Season Opener. 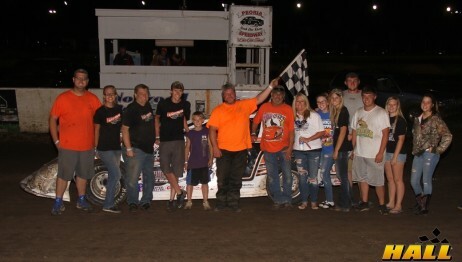 Another great year at Peoria Speedway-Looking Forward to 2016! 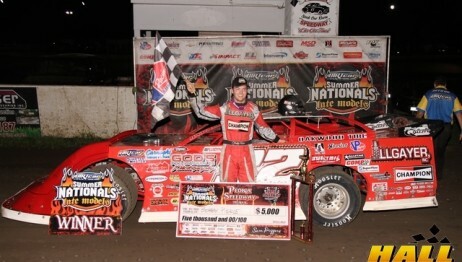 Thank you to all our sponsors, drivers, and fans! 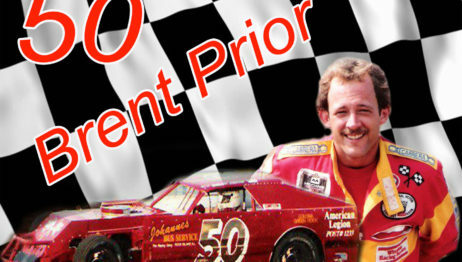 We are looking forward to our annual awards banquet on Sat. 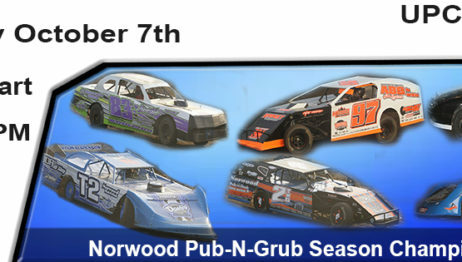 Nov. 7th at Childers Banquet Center. Please remember your RSVP’s are due today! 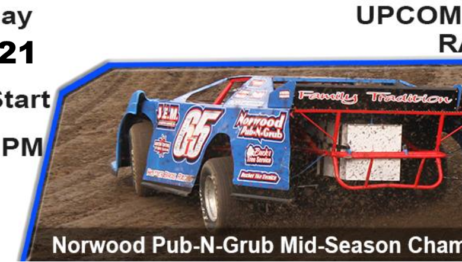 Our 2016 schedule will include: UMP Late Models UMP Modifieds Steel Block Late Models Crate Modifieds UMP Street Stocks UMP Hornets We will release our 2016 Season Schedule by the Allen Automotive Trade Show in January! 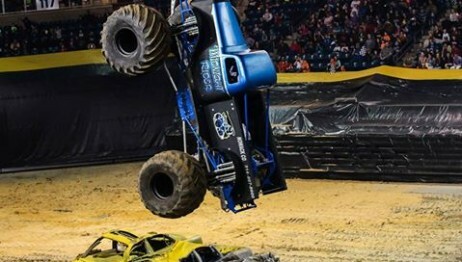 Reminder…Monster Truck Show starts Now! 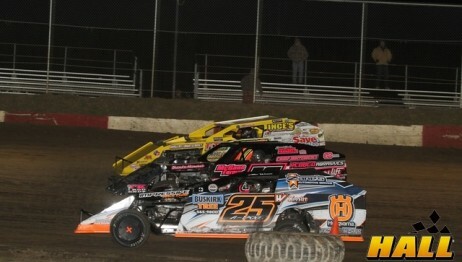 This is the last race of the season. The make-up race day scheduled for tomorrow is cancelled. 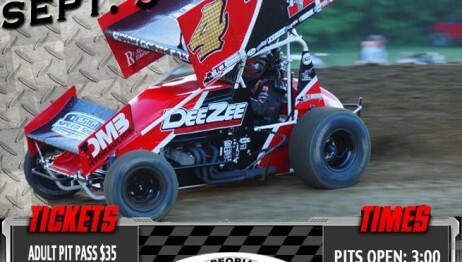 Thank you sponsors, racers and fans for a wonderful season! 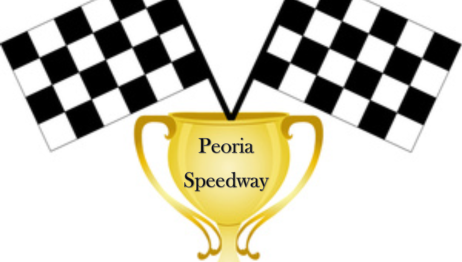 Peoria Speedway Annual Banquet-Saturday, November 7th at Childers Banquet Center in Peoria. 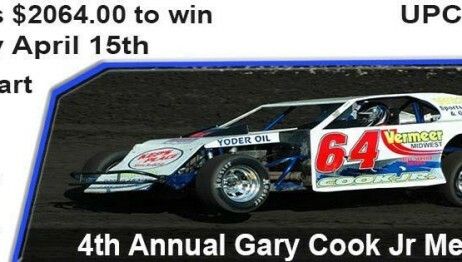 Tickets will be available this Saturday at the races. Must be present to win prizes and awards. 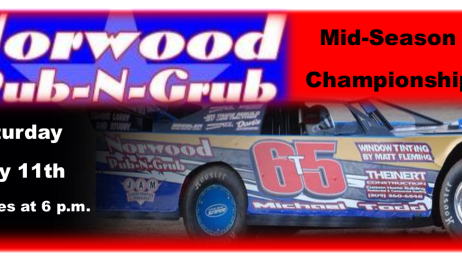 NOTICE: It has been brought to our attention that there is a discrepancy in the Modifieds point standings due to a software error. 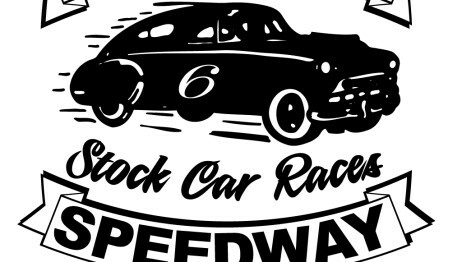 Therefore, we will be manually checking the point standings in all classes and we will publish the official standings next week. Thank you for your patience. 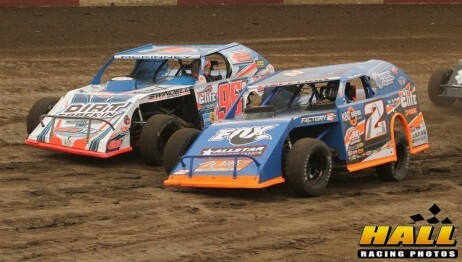 Peoria Speedway will be racing tonight! 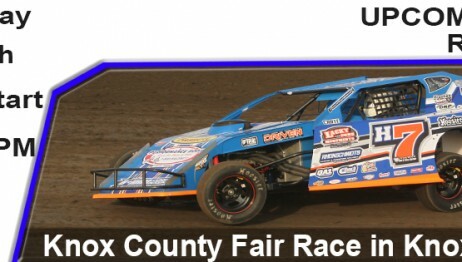 Saturday, September 19… Pit gates open at 3 PM and grandstands open at 4 PM. 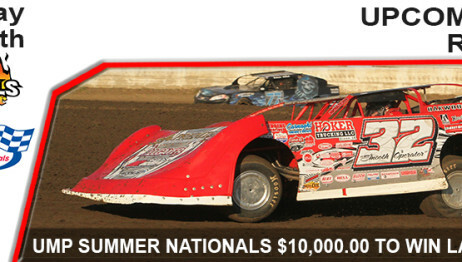 $10,050 to win! 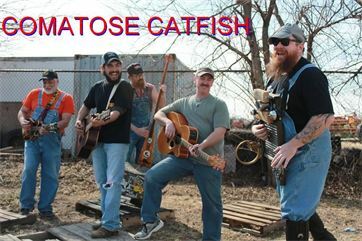 Live Band Tonight at Peoria Speedway-8 p.m.
Join us tonight at Peoria Speedway for live music from Comatose Catfish! 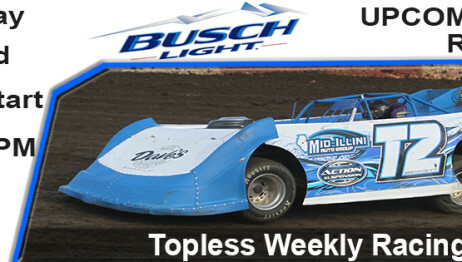 8 p.m.-Camping, Beer tent and concessions available! 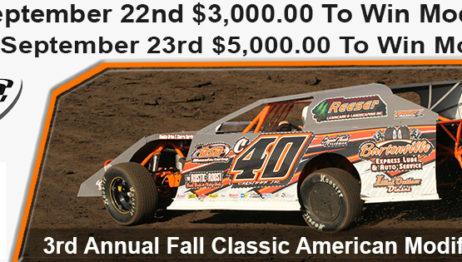 Fall Classic This Weekend-2 Day Event-$10,050 to win! 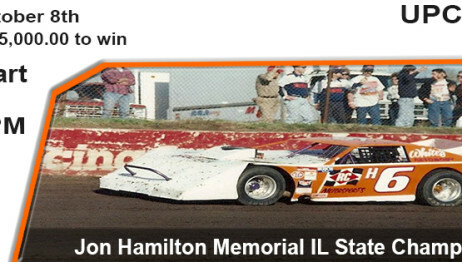 This Saturday, Aug. 29th, is the Herb Shannon Memorial Race. 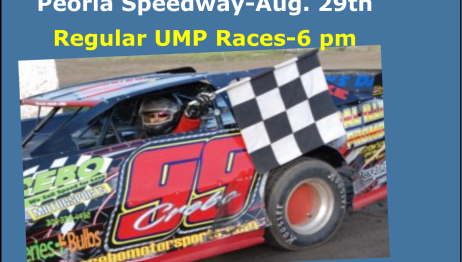 We will be running a regular UMP race night plus vintage cars. Please join us! 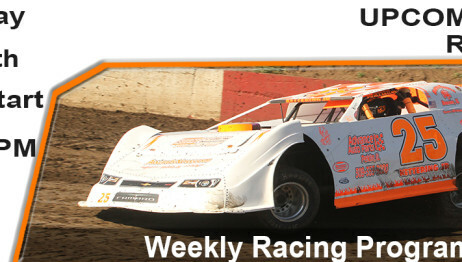 Pits open at 3 p.m., Grandstands at 4 p.m. and Racing begins at 6 p.m.
Join us in two weeks! 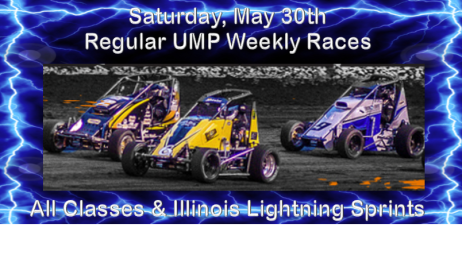 Saturday, Sept. 5th for the Sprint Invaders Sprint Car Series…Also running LM, Mods, SBLM, Street Stocks, & Hornets- NO CRATE MODIFIEDS. 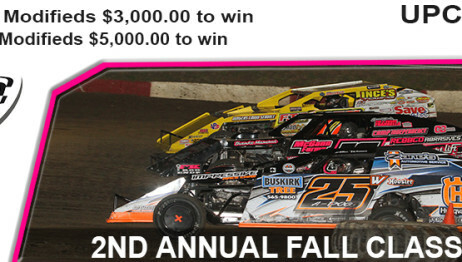 1st Annual Fall Classic-Modified Race $10,050 to Win! 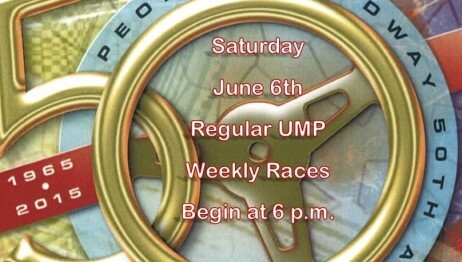 Regular UMP Races This Saturday! 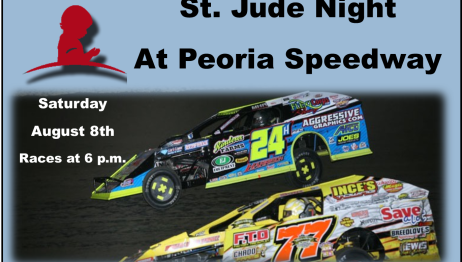 St. Jude Night at Peoria Speedway on Aug. 8th! 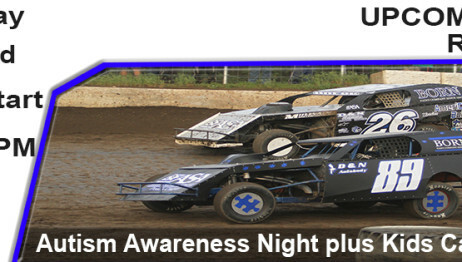 Join us this Saturday, August 8th at the Peoria Speedway for St. Jude Night! We will have face painting, candy dash, driver meet and greet, 50/50, and a balloon release for the children! 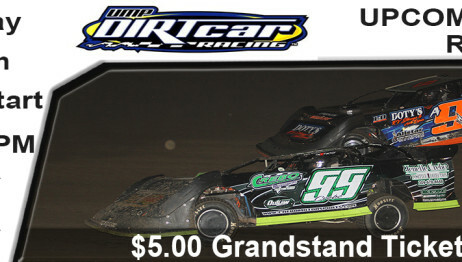 Grandstands open at 4 p.m. and races begin at 6 p.m. 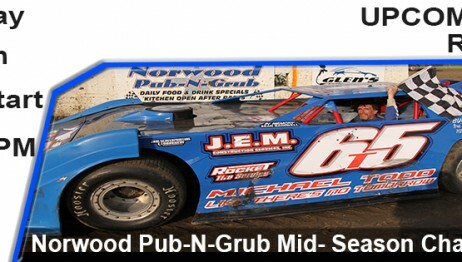 This Saturday, July 11th, join us for the Norwood Pub-N-Grub Mid Season Championship at Peoria Speedway! 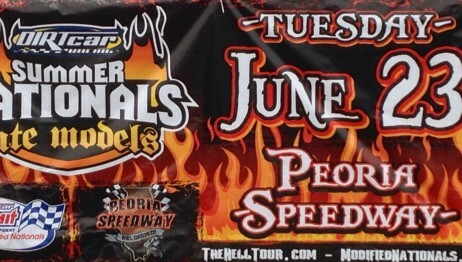 Races begin at 6 p.m.
Join us this Tuesday, June 23 for the Summer Nationals at Peoria Speedway! 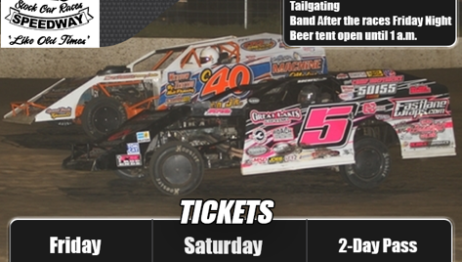 Grandstands-Adult $25.00 Children $10.00 Pits-Adults $40.00 Children $20.00 Pit Gates Open at 3:00 p.m. Grandstands Open at 4:00 p.m. 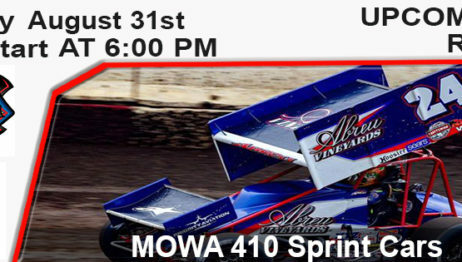 Drivers Meeting at 5:45 p.m. 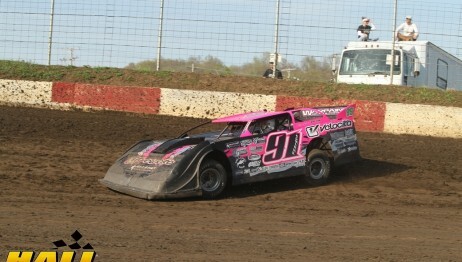 Hot Laps at 6:00 p.m. 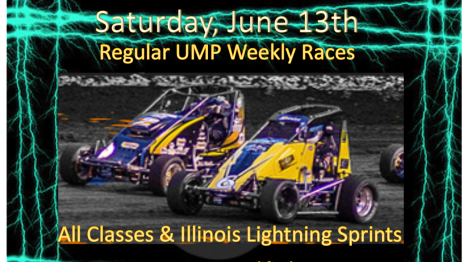 Regular UMP Races Saturday, June 13th! 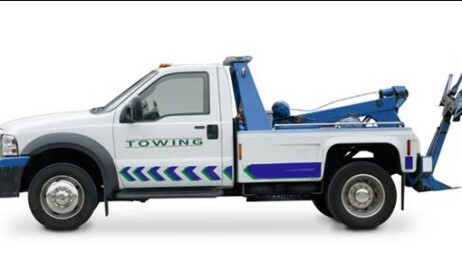 Peoria Speedway is looking for a towing company who is interested in sponsoring us this season. 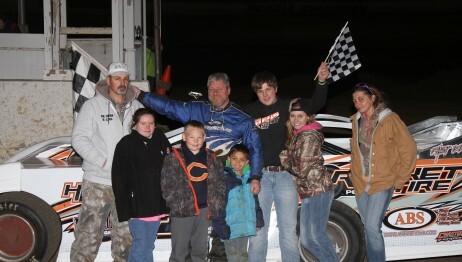 Sponsors will receive free admission for both the driver and assistant for every Saturday night race. 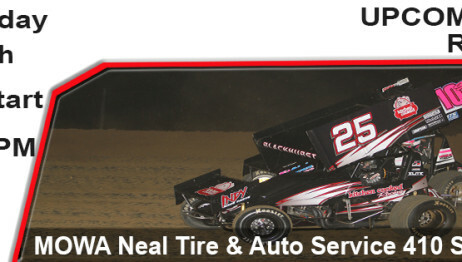 Driver will need to be available from 5-10:30 p.m on race nights. 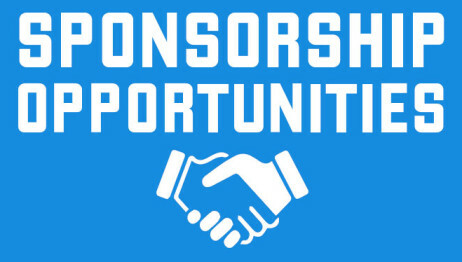 Sponsorship will also include advertising on our Facebook page, Website and at the track (Billboard Included). 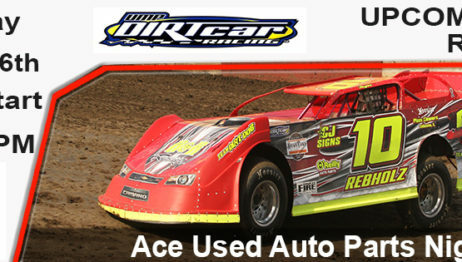 Please contact Jason at 309-357-3339 if you are interested. Thank you! 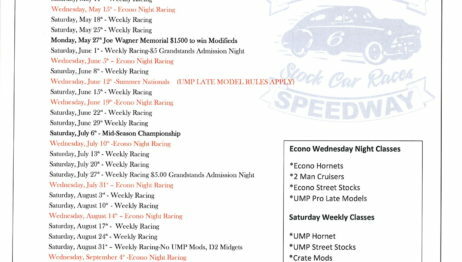 Schedule Change: Due to the lack of support for the Crate Modified Class, we are changing our schedule for the remainder of the year. 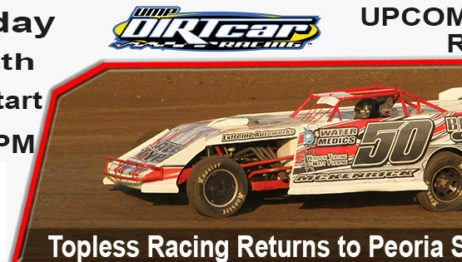 Effective immediately, the following races will no longer be running the Crate Modified Class. 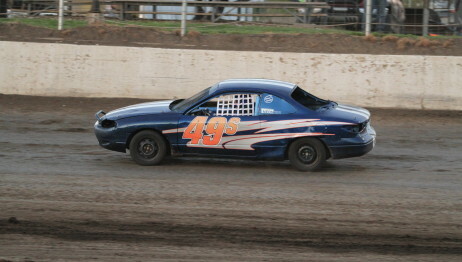 We will be replacing it with the Street Stock Class. 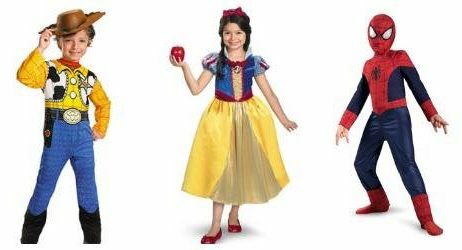 May 30, July 3, Aug. 22, Sept. 5, and Oct. 3. Thank you. 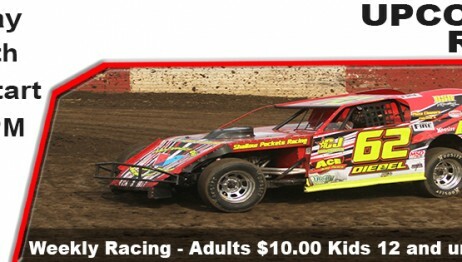 Peoria Speedway Releases 2015 Schedule!